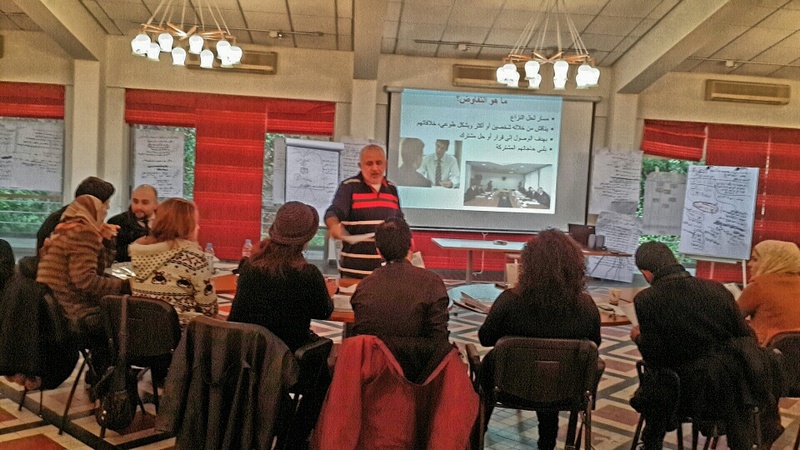 With the support of the British government Department for International Development (DFID), International Medical Corps and the American University of Beirut (AUB) recently organized two training sessions for Syrian refugees working or volunteering for various local and international non-governmental organizations in Lebanon. During the week of January 26-30, 2015 entitled “Introduction to Humanitarian Systems and Project Management Cycle” and another training session February 2-6, 2015 entitled “Introduction to humanitarian principles and participatory program implementation for community workers.” International Medical Corps sent invitations to nongovernmental organizations asking that they nominate participants for the training, and 46 Syrian aid workers were selected. The participants were divided into the two training sessions based on their knowledge and experience. By building the capacity of Syrian refugees in terms of emergency response and management of development programs, International Medical Corps hopes to assist Syrians to take a more active role in the current response, expand their skills, gain employment and become future leaders in the field of relief and development. International Medical Corps signed an agreement with the American University in Beirut which designed the syllabus, selected trainers and conducted the training in one of their local classrooms. 26-year-old Samir* is a volunteer with a local non-governmental organization in Lebanon. He fled Suweida in southern Syria and switched his career from a writer to a volunteer humanitarian aid worker. “I think the workshops were very useful because as a Syrian, I have dreams but I don’t know how to concretize them. It is easier for me now to plan and organize myself. Project planning and strategy building topics gave me skills that I could use even in my personal life,” said Samir. Zahra*, 33, ran away from the bombing and fled her village near Hassakeh with her two children 18 months ago. She was an English teacher in Syria but preferred to help her community by doing humanitarian work after arriving in Lebanon. “I already have some experience in humanitarian work since I was volunteering for Iraqi refugees who fled their countries and settled in Syria few years ago. Now I, myself, am a refugee,” Zahra said. “I enjoyed the training because I had many questions for the trainers. I shared my experience and at the same time learned new methods especially in project cycle that I will put into practice,” she said. Since its inception in 1984, International Medical Corps has been committed to building the capacity of devastated communities so that they can recover, rebuild and become self-reliant.